We’d love your help. 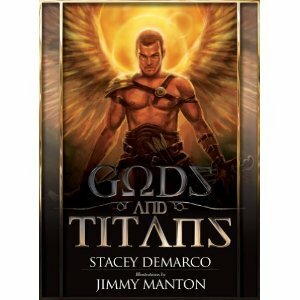 Let us know what’s wrong with this preview of Gods and Titans Oracle by Stacey Demarco. A beautifully illustrated oracle deck with a focus on the Divine Masculine. To ask other readers questions about Gods and Titans Oracle, please sign up. Absolutely loved the art work on these card. I used to recommend these to the men who used to come into my shop to buy divination cards. Let's be honest, most card decks are geared towards women so it was nice to see a deck that was more masculine. I also bought the goddess deck as well and they have equally great graphics. Dramatic, strong imagery, an absolute powerhouse of a deck. Highly recommended. Stacey Demarco is an internationally respected spiritual pagan practitioner, Witch, author and activist who hails from Sydney, Australia. Her passion is to make practical magic accessible to everyone and to reconnect people with the power of nature. Her down-to-earth yet scholastic spiritual style and her skill at weaving ancient techniques to solve modern problems, make her popular amongst clients Stacey Demarco is an internationally respected spiritual pagan practitioner, Witch, author and activist who hails from Sydney, Australia. Her down-to-earth yet scholastic spiritual style and her skill at weaving ancient techniques to solve modern problems, make her popular amongst clients and a regular contributor upon all things spiritual across television, radio and other media.